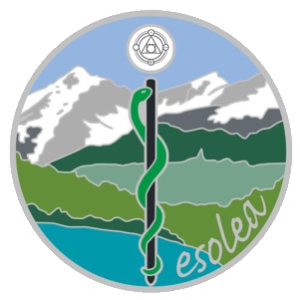 Esolea Expeditions & Research, Inc.
Primary Source: The emblem of the Corporation is highly symbolic; mountains, skies, water, and trees symbolizing their commitment to maintaining & furthering exploration in The Galaxy, and the serpent rising up a rod toward the sky symbolizing a never-ending pursuit for the preservation of life. The symbol within the small circle are the alchemical symbols for the basic elements of the Galaxy. Corporation Name: Esolea (Eh-So-Lee-A) Expeditions & Research, Inc.
Esolea Expeditions & Research, Inc. is a newly-formed company, financed by the Silver Jedi Order with its headquarters on the planet of Randon, only a short distance from Kashyyyk (home to the SJO). The primary focus of the business is in exploratory expeditions to unknown or poorly explored regions of space, identifying resources, mapping terrain, and identifying points of interest - This is accomplished by EE&R’s “Advance Expeditionary Directive”; the Corporation’s largest & most well-staffed division. Secondarily, EE&R, Inc. operates a smaller, highly specialized Research & Development division known as the Resource Application & Management Team (RAMT) which researches, develops, and manufactures specialized Tech & Equipment for use by the Corporation’s expeditionary teams & for sale to a closed market. EE&R, Inc. was created to fill a potential void in the SWRP Marketplace: Planetary scouting & mapping expeditions, Resource location and Management & scientific research - along with a subsidiary which provides High-End Tech and Survival Supplies. While they do not offer much in the way of large-scale Terraforming Services or Colonization Operations, EE&R seeks to become the premier provider of “Galactic Intelligence” - the disposition of celestial bodies, terrestrial locations, rare resources, and points of interest across the Galaxy. Along with their expeditionary fleets, EE&R offers a number of services such as Resource Location, Terrain Visualization for eventual settlement or further expansion, and exploratory missions on a small or large scale. Secondly, EE&R, Inc. is a manufacturer of high-end survival equipment & tech, including a selection of specialized armors & gear (often used by its’ own expeditionary teams). Much of the data the Corporation accumulates is either sold off to interested parties or utilized by the Corporation itself to further its own goals. Drystan Marakos, Senior Jedi Knight of the Order, approached the Masters of the Order with a business proposition: Increase the Order’s influence in The Galaxy by increasing their awareness of worlds & resources within it. She hopes to capture a niche market, offering services to Governments across the Galaxy as well as providing a vehicle for privately funded journeys. Edited by Drystan Marakos, 30 September 2018 - 08:54 AM. The Saotome Submersible - Strictly for underwater applications. Edited by EE&R Inc, 13 October 2018 - 01:18 PM. The Seimei Hand Axe - A compact, highly versatile tool. Capable of collapsing into a smaller package. Standard Issue gear to members of the Advance Expeditionary Directive's Operational Roster. The Seimei Glowrod - A powerful illumination device for use in all situations. Standard Issue. The Seimei Restoration Kit - A set of archeological tools for the explorer or adventurer. Standard Issue. Firerod - Commonly available chemical firestarter. The Sato Hardlight Blind - Emergency Survival Shelter, standard issue to AED Personnel. The Weylan Dyutani Hydration System - Emergency Water Supply for AED Personnel. Operates in all environments. The Shatory Index - A handheld, easily accessible database on The Galaxy's known catalogue of animals & species. New entries may be added upon identification. The Fennec Blaster Pistol - Powerful handheld blaster; issued in small numbers. Edited by EE&R Inc, 10 October 2018 - 12:33 AM. Edited by EE&R Inc, 10 October 2018 - 02:56 AM.